I've been away for a week or so. It's been so busy with PTSA, work, kid homework and everything else that happens in between. I have been itching to get in the kitchen. The Nutella Brownies that were made last week were only little baking fix. It was a blustery rainy day today and that didn't stop into the night. I made a quick dinner and relaxed a little before starting on the evenings sweet treat. A long day smoothed over with an evening in the kitchen. How all evenings should be. I started with making salted caramel sauce. Easy, delicious and relaxing. Once you make your own, you won't want to buy it ever again. 1/4 teaspoon fleur de sel or coarse sea salt (or to taste) I generally don't have salted butter so I used to a little more fleur de sel. 1. Spread the sugar in an even layer in a large metal Dutch oven or casserole, at least 6 quarts (6 L). On moderate heat (about medium) and cook without stirring, until the sugar near the edge just starts to liquefy. 2. Using a wooden spoon or silicone heat proof spatula, begin gently stirring, pushing the melted sugar around the edges toward the center and delicately stirring up any sugar melting on the bottom as well. The sugar will start to look pebbly as it cooks, but keep going; it will melt completely as it gets amber. 3. Keep cooking until the sugar turns deep brown and starts to smoke. (Don’t worry about any large chunks of caramel.) The darker you can cook the sugar without burning it, the better the final sauce will taste. It’s ready when it’s the color of a well-worn penny, and will smell a bit smoky. 4. Take the pot off of the heat and quickly stir in about a quarter of the cream. The mixture will bubble up furiously, so please wear an oven mitt over your stirring hand. Whisk in the remaining cream, to make sure it’s smooth. Stir in the butter and salt. Serve warm. 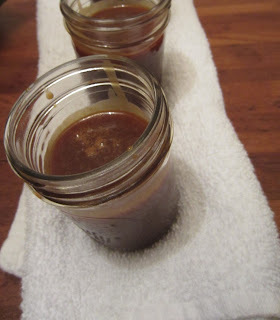 If you like your sauce a bit thinner or less rich, add 1/4 cup water. Caramel will last about a month or so in the fridge. Warm it in a small sauce pan or in the microwave to use. 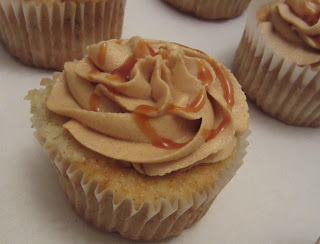 I used this caramel to top a moist banana cupcake that was topped a second time with a light peanut butter frosting and drizzled with more caramel. Preheat to 350°F. Line 12 standard (1/3-cup) muffin cups with paper liners. Whisk flour, baking powder, baking soda, and salt in medium bowl to blend. Mash bananas with fork in another medium bowl until smooth. Mix sour cream, vanilla and rum into bananas. Using electric mixer, beat sugar and butter in large bowl until light and fluffy, about 3 minutes. Add egg and egg yolk and beat until well blended. Add flour mixture in 3 additions alternately with banana-sour cream mixture in 2 additions, beginning and ending with flour mixture and beating just until blended after each addition. 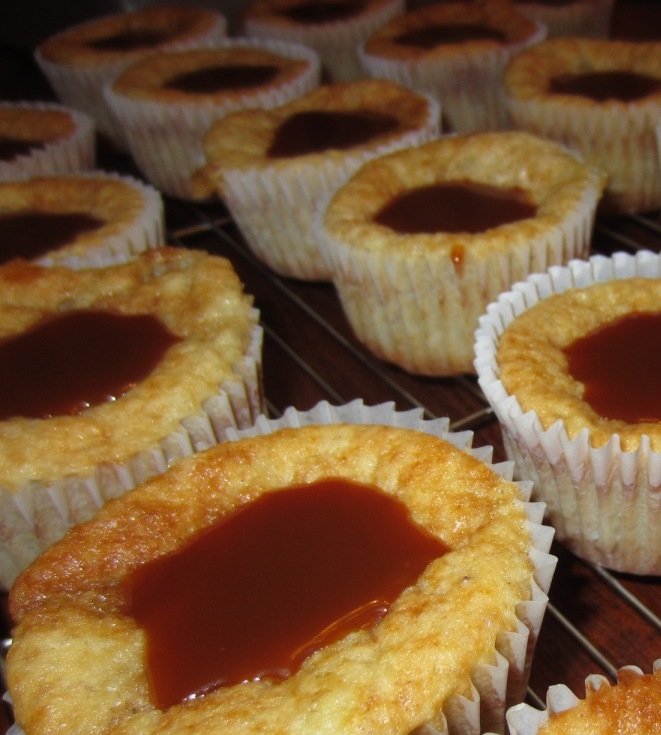 Divide batter among prepared muffin cups (generous 1/4 cup for each). 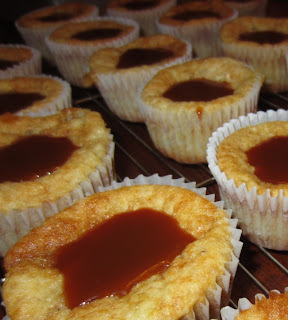 Bake cupcakes until tester inserted into center of each comes out clean, about 20 - 25 minutes. Transfer cupcakes to rack and let cool completely. The cupcakes sink a little in the middle. 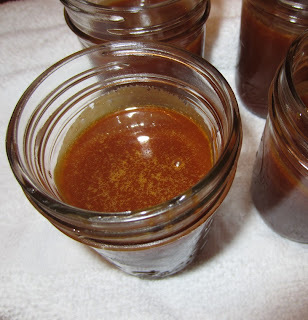 Perfect for adding some of the caramel. Lastly, whip up some peanut butter frosting to pipe on top of the banana caramel goodness. This will frost about 20 cupcakes. I used a large star tip.